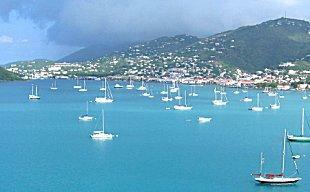 St. Thomas, U.S. Virgin Islands is the birthplace of Diamonds International. The glitter of diamonds and other precious gems has a universal appeal, and no jeweler understands that better than Diamonds International. With more than 100 store locations in dozens of nations, this exquisite jeweler specializes in only the best diamond, tanzanite, and gemstone jewelry. Founded in 1986 by a pair of graduates from the Gemological Institute of America, this elite company focuses on high quality gems and both classic and contemporary designs. From a single boutique in St. Thomas in the U.S. Virgin Islands, the company has grown to include stores in dozens of Caribbean nations such as Aruba, the Cayman Islands, and the Bahamas, as well as locations in Mexico, Key West, Las Vegas, and Alaska, making the company truly and international phenomenon. Solitaires: Classic single stone rings with princess and round shapes in simple settings ranging from one-third to a full carat. Contemporary Rings: Innovative styles with accent stones and marquise shapes for stunning configurations. Empty Settings: Perfect for designing a unique ring, these mountings are available in different styles and come complete with accent stones. Bridal Sets: Both two- and three-ring sets are available in a variety of designs to meet both style preferences and convenience. Gemstone Rings: Startlingly beautiful rings with colored gems, including tourmaline, garnet, pearls, aquamarine, and tanzanite. A large range of wedding bands are also available to complement any engagement ring. Bands are available in white gold, gold, and platinum, as well as with or without diamonds. Pave settings, partial eternity rings, and multi-tone rings are all available in a range of widths. Diamonds International also offers a range of jewelry items for men, including suitable engagement rings or other affectionate tokens such as watches, necklaces, and more. Men's wedding rings are also available, including diamond and titanium designs. 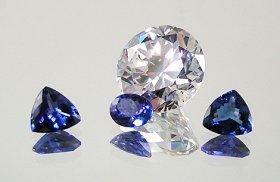 Diamonds and tanzanite are the company's specialty. For individuals who aren't interested in bridal jewelry, the boutiques also offer an extensive range of other styles, including stud earrings, fashion earrings, bracelets, pendants, necklaces, and more. These make exquisite promise or engagement gifts, or are suitable just as a special memento of a treasured relationship. With expert salespeople and a hard-earned reputation for quality, this company has made the jewelry shopping experience pleasurable and relaxed. Whether online or in a boutique, prospective buyers will find knowledgeable advice in the form of detailed guides about buying jewelry, judging gemstone characteristics, and even how to select the perfect piece as a gift for someone special. Diamonds International prides itself on encouraging buyers to become expert consumers, allowing them to make educated choices about the jewelry they invest in, and the store works to be sure all its customers have the necessary information at their fingertips. In addition to educational guides, the website offers detailed information about each piece, including the type of setting, stone cuts, metal, and other vital characteristics. This jeweler stands behind its merchandise by offering a 30-day return policy for all online and catalog orders so that buyers can shop with confidence. Furthermore, the company will provide a lifetime full credit on an upgraded piece as long as the new jewelry is at least twice the value of the original. For more information about Diamonds International, visit the official website www.shopdi.com or call 1-800-51-JEWEL.